Wow – talk about a burst of flavor from a cold salad. The first few bites are “ok”, but then the earthiness of the toasted pecans, the sweetness from the cranberries, and the tang of the dressing combine perfectly. My husband said it’s almost like a savory oatmeal – minus the oats. Taken from The Whole Life Nutrition Cookbook by Alissa Segersten and Tom Malterre, MS, CN. Preheat oven to 300° F. Rinse quinoa in a fine mesh strainer under running water for a few minutes. Place into a medium pot with the water and a pinch of sea salt. Cover and bring to a boil, then reduce heat to a simmer; cook for about 20-25 minutes or until done. Remove from heat and let pot stand for about 20 minutes. Heat the TBSP of olive oil in a skillet over medium heat and add red onions, thyme, and Herbamare. Saute for 5-6 minutes or until onions are soft and are beginning to turn color but not browning. Place pecans in a small pie plate or cookie sheet and lightly roast for about 10 minutes. Watch carefully as they can burn easily. Remove from oven and let cool. Place cooked quinoa into a large bowl. Add cooked red onions, toasted pecans, dried cranberries and chopped parsley to bowl. Mix together. 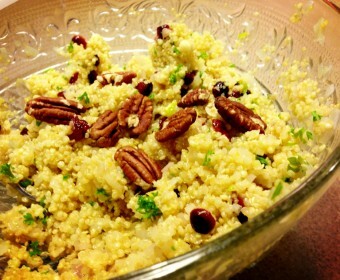 Pour the orange juice mixture over the quinoa and gently mix. Add sea salt or Herbamare and freshly ground black pepper to taste. Add pecans (we like to roughly crush/shop them to release more flavor) when ready to serve.